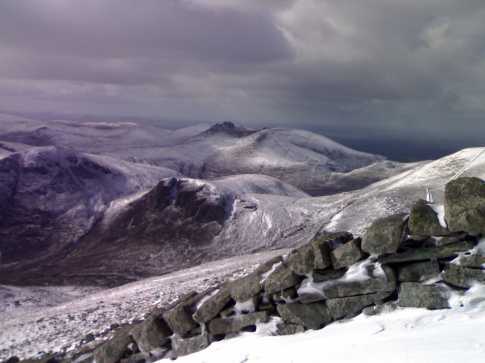 My very first trip to the Mournes was in March’07. Not only was I intending to climb Donard but I really wanted to see the infamous Mourne Wall too. I left Dublin early and eventually found my way to Donard Park carpark in Newcastle at approx J 376 307 I.
I followed the track from the carpark up along the Glen River. It was a nice walk which got me warmed up on that very cold day. Following the track brought me to a useful information board at approx J366 297 J, which described a curious Ice House situated further along the track across the river. The track then led past this Ice House and into the valley below Donard and Commedagh. Being my first trip to the Mournes I was surprised at how easy this navigation was-far different from staring across featureless bog in deepest Wicklow! Just following this clear track was going to bring me from the carpark right up to the col below Donard! The stone track brought me to the top of the valley, across a stream and headed up to the col in a series of steps. It had been getting progressively colder and extra layers were needed. Also snow lay on the valley slopes. I discovered that the track up to the col was covered in ice in many places and impossible to walk on. I scrambled up beside it but it was difficult and I needed my wits about me. I had seen the Mourne Wall from below but it disappeared from view as I climbed. I was thrilled when I eventually reached it. To seasoned Mourne walkers the Wall is an everyday thing that is probably invisible to them, but to me it was the Thing of Legend. I admired the breathtaking views from the Wall across the Mournes. A fantastic stile allowed an easy climb over the Wall. I couldn’t name any of the unfamiliar summits. It was too cold to take out the map and snow lay all across the hills. I then turned left to begin the trek up along the Wall to the summit of Donard. I had never seen such a steep climb, and snow lay in deep drifts to further test my will. The details of that tortuous and soul-sapping climb would require a book in itself but suffice to say I made it. 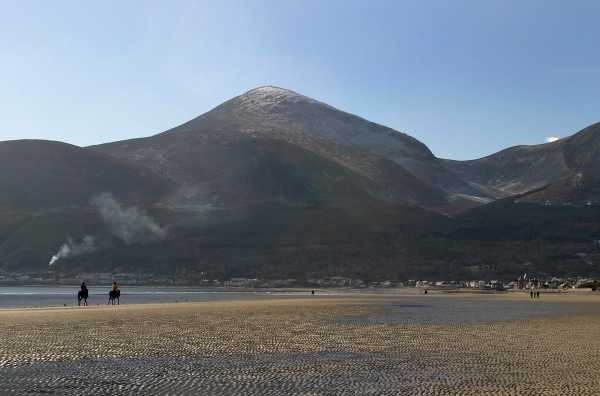 The accompanying photo shows the majesty of the snow-covered view from Donard that day. I was really getting a baptism of fire! 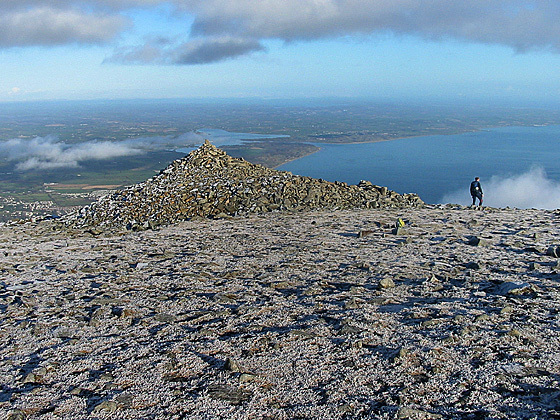 People climb Bearnagh, walk Commedagh and "do" Donard - y'know, the way you "do" Shakespeare or Yeats. Although the views into Dundrum Bay on hot summer days are singularly sweet, she is simply not the most exciting (if tallest) of the Mourne tops. So how do you "do" Donard and make it interesting. Simple - come off her. Exit South through the back door towards the brown bog of the same name. The descent will give you completely mindblowing vistas over the strange Annalong river to the tops Binnian to Beg. By negotiating the Buttress (you have to go looking for the track made by a one legged sheep, above the Buttress face) you get that strange sensation of almost touching the other side if only the glen weren’t between you and the target. There’s lots to see and do - as say the brochures - Hare’s Castles, old quarry works, hints of olde worlde humans, a fascinating (well for the moraine hunters) dunno what it is - some kind of glacial oxbow, beautiful flora and fungi, in the summer buzzy bees and perfumed bell heather, ravens swimming the air - the whole heap. 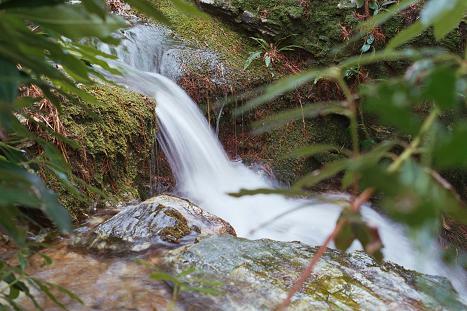 Drop down to the river - if you can tear yourself away, you have the choice of coming back up the main Annalong track West of the water and in the lee of the terrifying Lamagan slabs, and spooky gullies of Cove and Beg. Or you can follow a wall up to Binnian’s Back Castles and top-hop back to Donard. To “do” Donard, leave her - and I promise you, she’ll call you back. Slieve Donard being the highest peak in the Mournes offers some fantastic views in reward for walking to the summit. Gaze south over the Carlingford Mountains and beyond Dundalk Bay towards the Wicklow Mountains shimmering seductively on southern horizon. The Isle of Man and a glimpse of Scotland attract the eye eastward with Belfast City easily visible to the north. Lough Neagh completes the cardinal tour to the west. The Mourne Peaks and Tors dominate the immediate view from south to north laid out below as a 3 dimensional map, tempting further walking and exploration. Indeed, many a day I’ve spent walking here, choosing routes and peaks almost at random. From the summit delight in the birds eyes view of the local drumlin countryside. Study the low lying land that melds into Dundrum Bay encircled with what looks like end moraine formations. Trace the tree lined rivers that tumble toward the sea. Are they remnants of once torrential glacial outflows? Try and picture in your minds eye the great glacial ice sheets spilling from the mountain valleys sculpting and moulding the terrain laid out below.